Did you know that Hilary Swank raises her own chickens from eggs? She’s not the only celebrity getting into modern homesteading: Julia Roberts composts her kitchen scraps and chicken poop while Oprah has a 12-acre organic garden in Maui. Even the White House has a vegetable garden thanks to Michelle Obama! Anyone willing to give modern homesteading a try — from celebrities to people like you and me — can find it to be a fun hobby and a healthy lifestyle choice. Here are some tips for starting your own modern homestead. Ultimately, the perfect garden for you depends on where you live and what you’re hoping to get out of gardening. Straw bale gardening is a great strategy for gardeners on a budget, but a row garden may be a better choice for those who want something big. 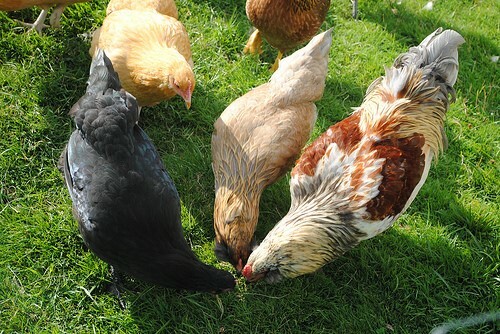 Chickens are an obvious livestock choice for a beginning homesteader. They’re easy to care for and provide a steady supply of fresh eggs. Orpingtons are a great breed to start with thanks to their charming personalities and egg-laying capacity. The key to raising chickens is to secure your coop. Learn what predators live in your area and how to keep your flock safe: You don’t want your chickens to get picked off by hawks and raccoons. Goats are smaller than cows, which makes them cheaper and easier to house, feed and transport. However, it also means they produce less milk. Cows need a pasture to graze in, while goats are less picky and prefer to browse in more wooded areas. Goats are expert escape artists, while a simple fence will keep cows in place. Cream is easier to get from cow milk than from goat milk. My advice is to start with a couple of goats before expanding — either by growing your goat herd or by adding a dairy cow to the mix. Zoning Ordinances: Your city may restrict the number or type of animals you can keep on residential property. Building Codes: If you’re planning on building a chicken coop or digging a garden, familiarize yourself with your city’s building code. Otherwise, you could be looking at a hefty fine or a lawsuit from a neighbor. HOA Rules: Your homeowners’ association may restrict what plants and animals you can keep in your yard, so ask about their rules. If your community forbids farm animals or gardens, don’t lose hope! In some cases, you can ask for special permission — called a “variance” in legal situations. The key is to ask ahead of time instead of waiting until you get in trouble. If all else fails, start small. A container garden is a great way to start homesteading without causing a legal ruckus. Whether you’re gardening in your windowsill or putting cows out to pasture in your backyard, modern homesteading is sure to make your life happier and healthier.